Ok so in this one there's only actually some nail art on my ring finger, but I really like the one nail I did so I've decided to feature it. I could have done a similar design on all of my nails, but that would have taken quite a while and I didn't have that long to do it. So I just painted my other nails with a black nail varnish containing a very fine silver shimmer, to fit with the Halloween theme. I'm sorry my pictures aren't very good but I didn't check them before I removed this and I unfortunately I don't have time to do them again before Halloween, and there's not much point doing them again after! Do you ever decide you like something and then become a little obsessed with it? That's what I've done recently with Sugar skulls! I've not really taken a lot of notice of them before but as we're approaching Halloween various makeup looks are popping up and I took a shine to Sugar skulls. I then thought that as long as I could get the design small enough, it would look great as nail art. Obviously as skulls are white I used a white base and went for my faithful Barry M Silk in Pearl as I didn't want a flat white, despite the fact that bone isn't slightly shimmery! I started off by placing the eyes first so I could work out how much space I had left for the rest of the features and any decoration. I wanted the eyes to be flat black rather than shimmery so just used a standard black and a dotting tool for the eyes. I then drew on the nostrils and the mouth with a black Sharpie. This years Halloween looks appear to be in association with Ciate as I used Boudoir (what I used for the blood in my dripping blood look) and then also used Ciate Electronica. I wanted to use a bright red and then couldn't decide on what other colours to use so pretty much went for the first one I picked up. It may only be on one finger but I'm really pleased with how it turned out and it looks amazing, if I do say so myself! 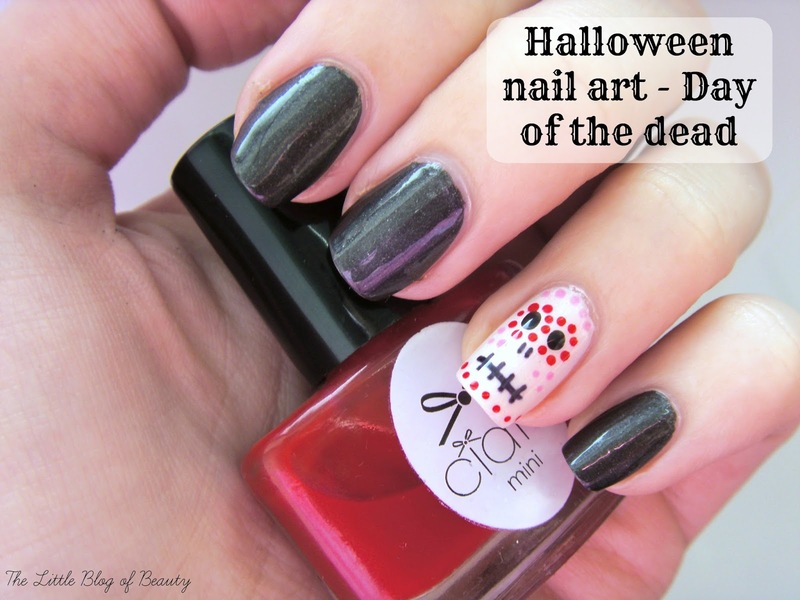 What do you think of my Sugar skull nail?